The United Nations Academic Impact promises to address worldwide challenges and engage students in global concerns. Catch a sneak preview of the award-winning film “Favorite Son” with writer, director and professor Howard Libov. Professor David Hanson’s images of the World Trade Center have become a moving historical tribute. 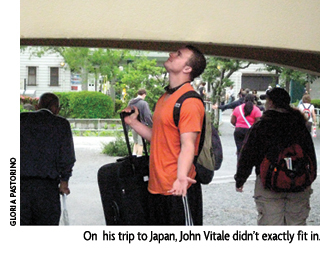 John Vitale describes his FDU study abroad experience in Japan, from mountain villages to the bustling Tokyo. tanding and holding up my tired 210-pound frame in a crowded and mysteriously quiet subway, I let loose a bear-like yawn. As I look to the petite young woman in front of me, she smiled and began to chuckle. I had come halfway around the world and could only speak three words in Japanese. However, the small moment was one of many where I would learn that with a little effort and drive I could connect and communicate with the people of Japan. I could begin to learn by immersing myself into Japan’s society and culture, rather than learn only from the sights I had seen and the lessons I had learned from Assistant Professor of History Gary Darden in my Pacific Worlds class. our of my fellow classmates and I decided to find what was called the Philosopher’s Path. We were told by our tour guide Mickey that it is a trail where professors of Kyoto University would walk and reflect. The mile-long path follows along a quiet canal, and cherry blossoms drape over the path creating a tunnel-like atmosphere. We decided to create our own little “pub crawl” along the way to the trail. After all, we were right next to a university and figured we could mingle with the local college students. This would become our first lesson in Japanese culture and one of my most memorable moments in Japan. Honyarado, a café, bar, restaurant and literary haunt, looked to us like it had not been open since the 1960s, with bottles of recognizable brand-named liquor wrapped with labels that were discolored and dated. We were greeted in seemingly perfect English by a small man in a bright blue Hawaiian shirt. We grabbed a round and sipped quietly until we gained the courage to ask about the town and the bar we were in. It turns out that the bar is owned by Kai Fusayoshi, a famous Kyoto photographer, who opened Honyarado in 1972 as a place where students can buy cheap meals and socialize. Furthermore, Honyarado organized efforts to help bring Vietnamese refugees to Japan during the American War in Vietnam. Five American college students on a trip to study the history and culture of Japan find their way to one of Kyoto’s famous cultural hotspots by pure curiosity. Some would call that fate. Continuing on our quest for the Philosopher’s Path, we encountered famous Japanese comedians filming in the streets and school children by the dozens flocking to meet the famed television stars. On our arrival at the trail, I experienced stillness, peace and tranquility. Our voices echoed off buildings, pushing us into a whisper when talking. Pacific Worlds is a semester-long course taught by Gary Darden, assistant professor of history, that includes the opportunity to spend two weeks across the Pacific. The course, which in the past has brought students to study abroad in both China and Japan, covers the history of the diverse cultures connected to the Pacific Ocean, including the changing interaction between East Asia, the Pacific Islands, Australia and the Americas from the emergence of the early modern world in the 15th century through the era of globalization today. This spring’s itinerary in Japan included Tokyo, Kyoto, Hiroshima, Nara, Kanazawa and the Japanese Alps. 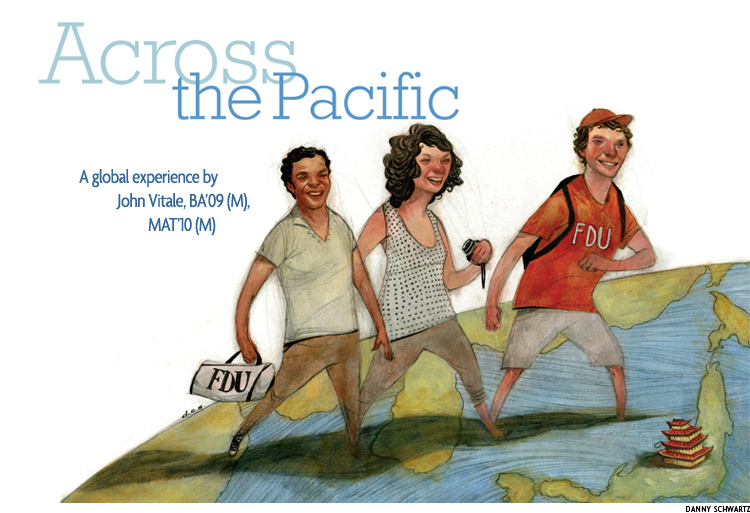 The next Pacific Worlds class, offered in fall 2011, includes a January 2012 excursion through Vietnam, Cambodia and Laos. For more information, contact Gary Darden, assistant professor of history, at darden@fdu.edu. 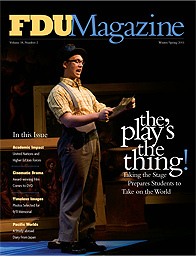 FDU Magazine is published twice yearly by the Office of Communications and Marketing, Fairleigh Dickinson University, 1000 River Road, H-DH3-14, Teaneck, N.J. 07666. FDU Magazine welcomes your comments. E-mail Rebecca Maxon, editor, at maxon@fdu.edu. For a print copy of FDU Magazine, featuring these and other stories, contact Rebecca Maxon, editor, at maxon@fdu.edu. To update your address e-mail fine@fdu.edu or update your profile online at www.MyFDU.net. ©Copyright 2011 Fairleigh Dickinson University. All rights reserved.